First things first: The Trip to Italy, the sequel to 2010’s surprise hit The Trip, may be the whitest movie ever made. Featuring immeasurable first-world ennui, the characters talk about Percy Shelley and Lord Byron like current pop icons and play deep album cuts from Alanis Morrisette’s “Jagged Little Pill” while driving a convertible minicar. The film was one PGA endorsement deal away from the most culturally white moment in human history. 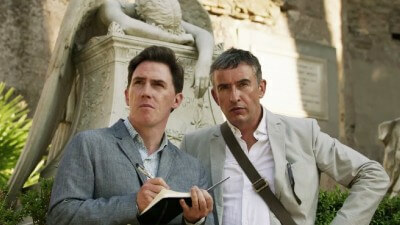 Once again, Steve Coogan and Rob Brydon play themselves on a lackadaisical all-expense paid trip, ostensibly under the pretext of writing a travelogue. Last time out, Coogan was more severe, clinging to vestiges of fame that had been reduced to a smolder from what was a four-alarm fire (at least in Britain). This time, Brydon’s career is ticking upwards, in a notably Coogan-esque fashion. Not only that, but the obligatory lady dalliance falls into the latter’s court this time around. Through the looking glass now, it is Coogan trying to be a better father and improved human being while Brydon yearns to shirk his branding as an aggressively affable human being. This shift is evident even in the casual dinner conversations, which inevitably degrade into celebrity impression contests. Whereas in the previous film, Brydon’s sometimes good/sometimes bad celebrity parroting seemed like an innocent quirk, here it is shown to be a coping mechanism for a man incapable of handling serious life issues as himself. Much like the first endeavor, The Trip to Italy is a comedy only in the daintiest sense of the word. More akin to spending time with friends who are almost as funny as they think they are, the film intentionally ambles from one moment to the next. Even when weighty elements occur, such as Brydon’s affair or Coogan’s problematic relationship with his son, they mostly brew deep inside the internal waters of these men, only burping a bubble or two visibly above the surface. Much in the same way that Richard Linklater’s Before Sunrise series is stunningly honest about romantic love, this series is fast establishing itself as one of the more realistic fictional depictions of friendship. That said, the realism does become mildly agitating at points. Brydon is your friend who wouldn’t stop doing Borat voices two years after the movie came out. At times, both characters feel outright grating. Yet, somehow, director Michael Winterbottom is always able to reset the film back to its amiable nature. Clearly, his intention in scuffing up his leading men in such a way is to take the sheen of performance off of them. It works, even if that’s sometimes a bad thing. One of the rare sequels that is a better movie than its predecessor, this installment is headier, funnier and a freshly sincere examination of heterosexual male friendship. A movie this muted isn’t designed to provoke a chair-throwing, exclamatory reaction so much as it is intended to be thoughtful and, for lack of a better term, “nice.” And so it is. The Trip to Italy may well be the nicest movie of the year.